It was coming on 5pm at the Farmer’s Market on Fairfax in Los Angeles. I’d just come from an important meeting, and I had to meet Jennifer. We’d arranged to meet in the carpark of the Farmer’s Market. 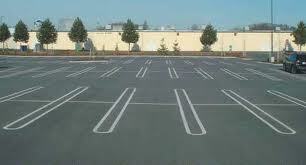 But everyone was Christmas shopping, and the carpark was full. The boom gate was down. There was a sign directing cars to another lot somewhere else. But I didn’t want to go somewhere else. I wanted to park in the Farmer’s Market. That’s where I said I’d meet Jennifer, and that’s where I wanted to park. As I approached the boom gate I saw the cars in front of me diverting to the other carpark. Car after car diverted to the other carpark. The car in front of me peeled off to go to the other carpark, leaving me the next car to approach the boom gate. I looked at the sign directing me to the other carpark but I drove past it and drove up to the boom gate. The carpark was full alright. It was jammed. As I got to the gate, I noticed a car pulling out, preparing to leave. I punched the big button for a ticket, and the boom gate went up. And as the car drove off I slipped into the most perfect car space I could have possibly imagined. Okay – what happened there? Firstly, this was not unusual. I had noticed that since coming back from Dallas, this happened every time I required a park. And I mean every time. There’s a coffee shop on Main Street, in Santa Monica, that Jennifer and I like to go to of a morning. It’s called The Novel Cafe. It does great coffee and it’s a quiet relaxing place where we can talk. We often meet our friend Andrea Keir there. There’s only street parking. And usually there are no spots on the street. Yet morning after morning, as I’ve driven up to the cafe, someone has pulled out right in front of me and provided me with the car space right out front. Literally right out front. That happened three mornings in a row earlier this week. And these are three hour parking spaces. There’s not a big turnover. On the one occasion when it didn’t happen, I noticed a spot across the road and I got that. Okay it wasn’t as perfect as getting the space right out front, but hey, I figured I was being taught a lesson in humility. Not to get too cocky! Getting the perfect parking space was happening elsewhere too – in crowded shopping lots, outside of restaurants, everywhere I needed to go, it seemed that miraculously, someone would drive out just as I was approaching, so that I could be the only possible car to get the space. It was getting freaky, it was happening so consistently. And then finally this happened at the Farmer’s Market. As I sat in the car waiting for Jennifer, I began to think about how to transfer this capacity to manifest the perfect car space into my everyday life. How can I take the perfect car space home with me? Okay, so before I get into that, let’s examine in detail what happened. Yes I asked. And that’s what I’d done on the other occasions when the car spaces miraculously opened up for me. I’d asked. As I was driving up to that boom gate I asked for the most perfect car space, and bloody hell, there it appeared. I trusted. I trusted that even on one of the busiest shopping days of the year, that I would get a parking space. Not just any parking space, but the perfect parking space. I surrendered. I risked other drivers honking me, waiting at the boom gate. I risked the personal humiliation of having to reverse out and meekly drive off to another car parking lot quite some distance away. But I knew that wouldn’t happen, because I trusted and I’d surrendered to whatever presented itself to me. Surrendering is so important in all this. You won’t get what you want unless you surrender to the outcome, irrespective of whether it be good or bad. I acted. As i approached the boom gate I saw the car beginning to leave, and I drove in to the waiting car space. I did something. I put my asking, my trusting, my surrendering, into action. So often in life we drive to the other parking lot, further away from where we want to be, because we’re directed there by orthodoxy. By authority. By our own willingness to accept something that’s not perfect for us. So often in life we have to walk a long distance to where we really want to go. We put up with the inconvenience, with the aggravation, with the loss of time and efficiency, we put up with the additional effort, and we begin to accept this as a natural part of our lives. You don’t have to walk a half mile to where you really want to be. You can go directly there, if you really want to. All you have to do is BELIEVE, ASK, TRUST, SURRENDER, ACT. As I sat waiting for Jennifer, it occurred to me that if I applied my method of getting a perfect parking space to the other aspects of my life, then everything would be so much easier. I would have whatever I wanted, without effort. Without walking that half mile. I see them as signs that I’m on the right path, that I’m doing what I should be doing, that everything is ok and that my guys are in my corner, cheering me on. I so completely “get” this post. Thank you so much for it. The small signals we receive in life that show us that “all is well” and that we’re on the right path, really help us with the bigger picture of our lives. Your statement “BELIEVE, ASK, TRUST, SURRENDER, ACT” is a powerful one. We in the PGS family know this is something that you and Jen always have very much at the forefront of your minds, in your hearts and in your souls. To receive this statement, and indeed to help us realize and remind us what the Universe is manifesting for us – however big or small – from all your posts, is a wonderful gift. Thank you. And at this time of year, when things even crazier out there, it is especially nice to have any sign of encouragement!! I have had a few amazing miracles occur recently that got me pretty excited! Certainly if silly things like parking spaces are provided, it is an overwhelming acknowledgement that other things are provided as well. And when it happens, we always must remember to say Thank You !! to God, Angels, Saints, Guides, Great Father/Mother, Creator or the what ever name you like to use for THE divine source! You’re so so right Kathryn. Thank you!!! Chesterton’s quote is very true Clare. What I was trying to say is that we make life more difficult for ourselves than we need to. I agree with Chesterton – life resides in the space between, where accidents and inconveniences lie in wait for us. I’ve been following your blog all this time, reading and taking in your journey, but somehow this “parking” post has really resonated with me. Maybe it’s because for many years now I’ve had my own parking angel. My beloved Dad who passed away many years ago was the canniest car park getter in life, and has since become my “patron saint of parking” – never once letting me down when I really need a park. So much so, that it’s become a running joke in my family. They now all ask for a park from Dad when they need it, and always get one! I keep telling them to get their own guy!! I don’t ask every time, but when I do, “he” always comes through. I’m going to print that out and stick it up on a wall somewhere so it can sink in. I think I’m going to have the most trouble with the Surrender part…..
Big love to you and Jen and all the family this Christmas. I hope the Mudgee weather angels are kind to you, and it’s not too hot. Hey Libby, lovely to see you here on the blog, and thank you for these wonderful words. We’re now back in Mudgee – a long way from Dallas! But looking forward to settling into Christmas with the family. Hope to see you and Wayne over the Christmas / New Year break. Plenty of stories to go around both sides of the table, I’m sure! Take care both of youse, and love to you both! This sort of thing happened to me ALL THE TIME on my 1994 pilgrimage from Paris to Compostela — well, as soon as I stopped doing it for myself, and committed my Pilgrimage to the souls of three priests of Western France who had been murdered by strangers that they had given shelter to. Hi Julian – thanks for your thoughts here. Can I ask – are you saying that I’m going through some kind of transformative phase, like you did on your 1994 pilgrimage? And if so, then what would it be? You’ve seen the transformative process for yourself, Bill, but the only thing I can say with certainty from my outside point of view plus experience, openly, is that your eyes are clearly opening — and this is linked BTW into the interpretation that I have of the objectively miraculous healing of your eyes and film-maker’s eyesight as well as into the personal interpretation that I have of your vision of the Cathedral Rosary stained glass shattering to give way to a field of open night sky and starlight. There is more than one thing here that involves my own personal stuff in its relation to yours, that I could not discuss with you except face to face, and not via either public nor private internet. One more thing though — whatever the nature and purpose of your transformation or metamorphosis may be, it is simply not possible that it can be similar to mine, nor anyone else’s, in its fundamental nature, because You are metamorphosing into You — so that the answer that you are seeking can only possibly be found within yourself, because that’s where God has put it. Dear Julian, then I very much look forward to the time when we can walk together and talk. Thank you for these observations. I’d completely forgotten about that dream of the stained glass shattering. Thank you for reminding me of it. Dreams seemed to have played, or are playing, such an important part in my transformation, as you put it. I feel like it’s as though I’ve fallen into a swiftly flowing river, and I’ve clutched onto a tree root and I’m clinging onto it desperately, to stop myself being swept down the river. But my hold on the root is slowly weakening, and the river current is getting stronger, and it seems like it’s inevitable that I will have to let go, and give myself up to the river, but still I cling to the tree root in a vain belief that I can return to the life I led before I fell. You’ll run rings around me! !